Social media offers to sell some of the world’s most dangerous snakes brought the seller and unwanted response, and now the reptiles are slithering in state custody. Police said a search of a 21-year-old Meriden man’s Westfield Road house found seven live venomous snakes and two dead ones. Cameron DeFrances was arrested on nine counts of illegal possession of wild animals and first-degree reckless endangerment. Among the snakes found alive were a Gaboon viper, a forest cobra, two Egyptian banded cobras and two monocled cobras. A tree viper and a king cobra were found dead. DeFrances had posted photographs on his social media account and listed the venomous serpents for sale. Officials said the living snakes were seized and safely transported to a secure facility for reptiles. “The exploitation, importation and trafficking of illegally taken wildlife threatens species in our country and across the world,” said State Environmental Conservation Police Col. Kyle Overturf. DeFrances was processed at the Meriden Police Department, released on a $1,000 bond and given a May 10 court date. None of the snakes found in his home are native to North America. 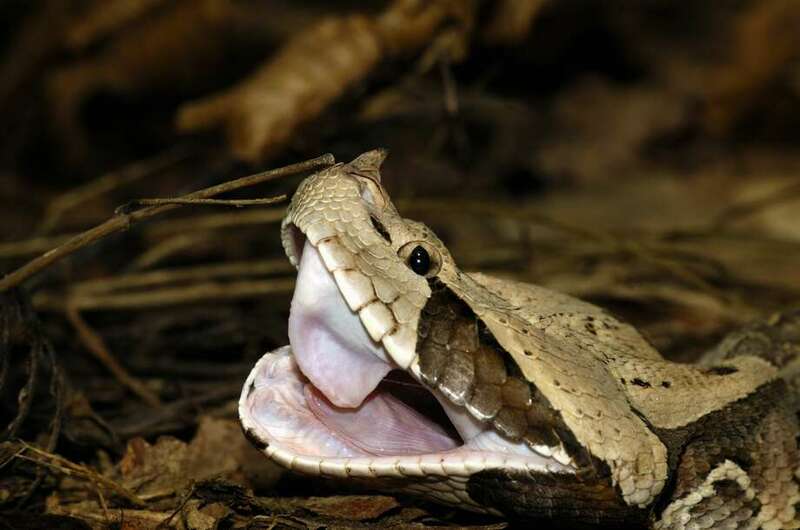 Forest cobra is at the top of the list of world’s 15 most deadliest serpents. This snake can be highly dangerous due to the quantity of venom it can inject in a single bite and its aggressive nature when defending. Death can occur rapidly, within 30 to 120 minutes. The species is native to Africa. It is the largest of the cobra species with a total length (including tail) to 10 feet. King cobras can reach 18 feet in length, making them the longest of all venomous snakes. When confronted, they can raise up to one-third of their bodies straight off the ground and still move forward to attack. They will also flare out their iconic hoods and emit a bone-chilling hiss that sounds almost like a growling dog. Their venom is not the most potent among venomous snakes, but the amount of neurotoxin they can deliver in a single bite—up to two-tenths of a fluid ounce—is enough to kill 20 people, or even an elephant. The snakes can be found in India and Southwest Asia. Monocled cobra venom is one of the fastest acting snake venoms in the world. Its venom, which has different potency depending on where the snake is found, can cause death within an hour. The neurotoxins in its venom leads to drowsiness, neurological problems and muscle issues. A native of Southeast Asia, it has a maximum length of 7 feet. Gaboon vipers are venomous and their bite can be fatal. Gaboon vipers have the longest fangs of any venomous snake, and can reach 2 inches in length. Gaboon vipers are the largest vipers in Africa attaining weights of over 45 pounds and reaching lengths of more than six feet. The largest snakes have heads that can be nearly 6 inches across at their widest point. Egyptian banded Cobra venom affects the nervous system, stopping the nerve signals from being transmitted to the muscles and at later stages stopping those transmitted to the heart and lungs as well, causing death due to complete respiratory failure. The Egyptian cobra is one of the largest cobras of the African continent. The average total length (including tail) of this species is between three and six feet with a maximum total length of just under 10 feet. The most recognizable characteristics of this species are its head and hood. The ancient Egyptians worshiped the Egyptian Cobra or Asp and it represented the "fiery eye of Re, t was used as a symbol on the crown of the pharaohs. Tree vipers are poisonous snakes that use hollow fangs to penetrate prey and inject it with venom. The wound usually feels extremely painful, as if it had been branded with a hot iron, and the pain does not subside until about 24 hours after being bitten. Within a few minutes of being bitten, the surrounding flesh dies and turns black, highlighting the puncture wounds. These snakes are found throughout Asia, Africa and South America. Connecticut has only two venomous snakes: the northern copperhead and the timber rattlesnake, and both are viewed by state Department of Energy and Environmental Protection as highly beneficial animals. They are fearful of humans and they try to keep to themselves.